The journey of the FIRST STEP Act, a prison-reform bill on the brink of congressional passage, entails many stories. It’s the story of a Corrections system that many people feel does little to “correct” society. Of families being torn apart when a father goes to prison for years over a white-collar crime. Of many prisoners returning to crime almost as soon as they are released. Of people who looked at the prison system — and the effect it was having on communities — and said something had to change. And it is the story of a young man, who, with neither resources nor political experience, had a dream and the will to see it through, over a decade of joys and heartbreaks, successes and failures, congressional debates and political infighting. Through years of cross-country trips, meetings with lobbyists and lawmakers, financial failures and dashed dreams, he was determined to do whatever it took to make the justice system more just, and relieve the burden of suffering families. In interviews with Hamodia, some of the key figures in the battle for criminal-justice reform share their experiences. Rabbi Moshe Margaretten is in the Hamodia office, speaking about the battle for prison reform that has consumed him for over a decade. But he can barely keep his eyes off his phone. Some major news is supposed to be coming down today – were last-minute changes to the FIRST STEP Act deemed acceptable by the National Sheriffs Association, which would make a dozen undecided conservative Republicans amenable to supporting the bill. And the phone rings almost continuously: calls from nameless caller IDs, which always begin with, “You are receiving a call from a federal prison; this call is being recorded,” from anxious prisoners awaiting news of a bill that may reunite them with their families. And calls from prisoners’ relatives, who look to Moshe — and what many people have described as “Moshe’s bill” — as their last hope for being reunited with their loved ones before the end of a long sentence. Moshe Margaretten, a 13-year-old boy from a family of Skverer Chassidim, had a close friend whose father was in prison. The Margaretten family moved shortly thereafter to Israel, where Moshe attended the Chernobyl Yeshiva in Bnei Brak. 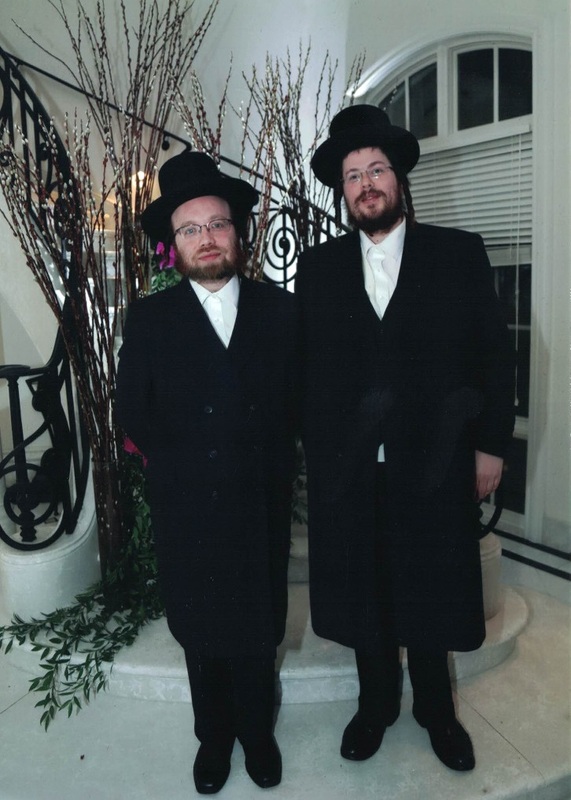 In 2001, Moshe, a young husband, moved back to the United States. 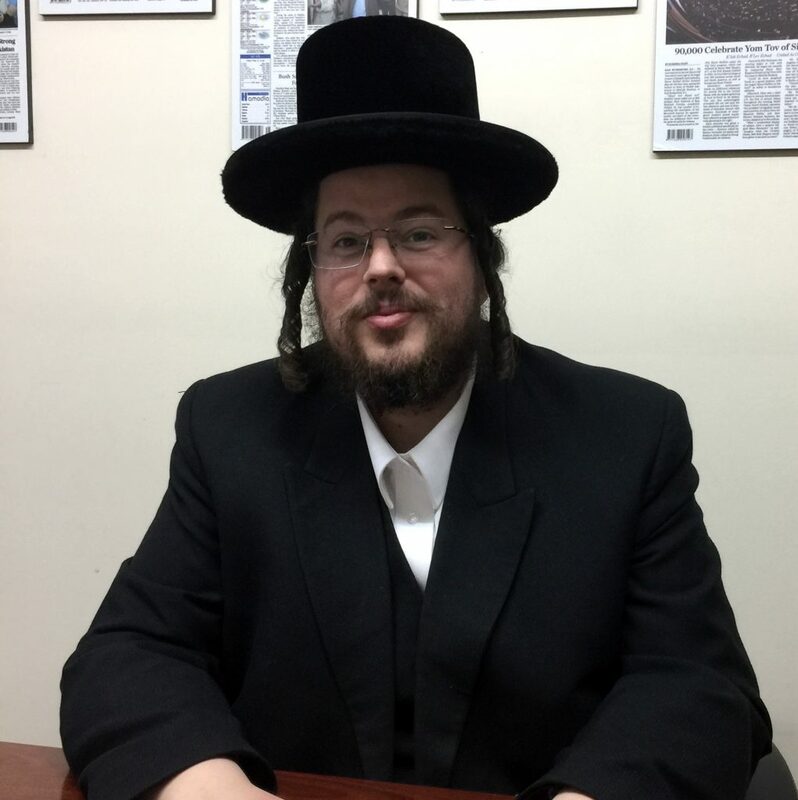 Moshe was now studying in the Gerrer Yeshiva in Boro Park, and living in Williamsburg. One day, he heard that Rep. Sheila Jackson Lee (D-Tex.) was proposing a bill called H.R.61, which would increase to 50 percent from the current 12.5 percent the time off their sentences that federal prisoners could earn for good behavior. “I saw that she only had a few co-sponsors,” says Moshe. So this young man from New York, who up to that point had had zero experience in politics or lobbying of any kind, saw an opportunity to realize his childhood dream of assisting prisoners. He, along with a friend, Mendy Rothchild, reached out to Rep. Lee’s office and offered their assistance in gaining co-sponsors for her bill. “I was hoping to offer her that I would try to get Rabbis across the country to reach out to their Congressmembers and urge them to support her bill,” says Moshe. “I wanted to try to build a coalition to help get it passed.” Margaretten and Rothchild called Rep. Lee’s office a number of times and spoke to her aides. One day in 2008 they decided to simply jump in a car and drive to Washington, knock on the door of her office and speak to an aide. The next year, in a last-ditch effort, he and Mendy worked on an email – sent from Mendy’s email address, as Moshe did not even have one – to the Congresswoman. But Rep. Lee’s office never responded to any of Margaretten and Rothchild’s requests. So Moshe begins researching lobbyists. Moshe’s friend Yisroel Meir Tauber invited him along on one of his trips to Otisville to see the inside of a prison firsthand. 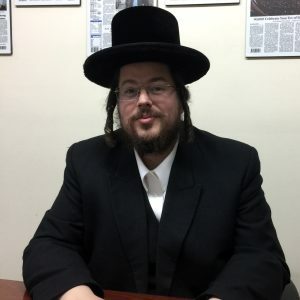 On a subsequent visit, a prisoner advised Moshe to contact another young activist for prisoners’ rights, 25-year-old, Los Angeles-based Rabbi Zvi Boyarski, of Aleph Institute. Several months later, Moshe received a call from the wife of a cancer-stricken prisoner who required help with his medical needs; Moshe then took the piece of paper from his pocket and dialed Boyarski. Moshe Margaretten and Zvi Boyarski in 2009. Zvi was all for the idea – as he was for anything that could help ease the burden of prisoners and their families. He had learned about the realities of the justice system during his time with Aleph Institute, an organization founded at the direction of the Lubavitcher Rebbe, zt”l, which advocates for the religious rights and well-being of prisoners, provides them with kosher meals and religious resources, and assists their families and advocates in court for alternative punishments for non-violent offenders, such as rehab or community service. Zvi admits to thinking that the plan was a bit far-fetched, “but I felt it was something that we had to work on. Because when you see families falling apart – and so many of them are in situations where the lengthy prison sentences are not warranted; perhaps an individual used poor judgment in a moment of desperation – you see how the collateral consequences of the prison system can be incredibly destructive. Boyarski arranged a conference call with a group of activists, discussing potential lobbyists. There were also several interviews with lobbyists, but none were impressive. Moshe accompanies Tauber on another visit to the prison. When they mention to a prisoner that they are looking for a good lobbyist, the prisoner suggested, “Why not find out which lobbyist worked on the Second Chance Act?” Signed into law by President George W. Bush in 2008, that Act allowed inmates to serve as many as the last 12 months in prison in a halfway house or in home confinement. “I looked at the filings online for that bill,” recalls Moshe, “and I saw an organization called Prison Fellowship Ministries.” It turned out that Zvi was quite close with Pat Nolan, a leader of that organization. 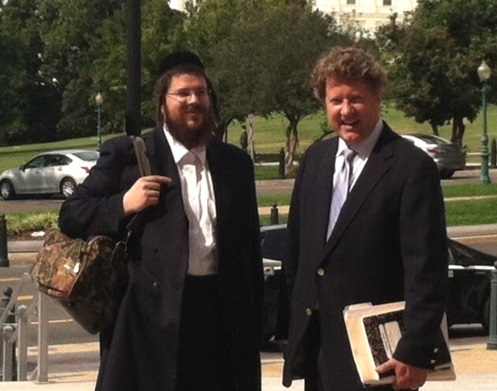 Moshe Margaretten and Greg Mitchell on Capitol Hill in 2014. For nearly two years, the project to hire Mitchell – founder of his own outfit, The Mitchell Firm, in Washington – has largely stalled, mostly for financial reasons. Now, just before Pesach, Moshe was visiting the prison again, and as he waited in the visitors’ room for the prisoner to come in, he saw a family visiting their own father and husband. In addition to the intense lobbying effort, Margaretten, then 31 years old, would accept the burden of raising the hundreds of thousands of dollars needed annually to advance reform. Moshe and Greg first sign a contract. Moshe now believes he has his man – the lobbyist who had been instrumental in getting the Second Chance Act passed. Their first opportunity was the Second Chance Reauthorization Act of 2011, which was about to face a test in the Senate Judiciary Committee. But that bill died with nary a whimper, receiving not a single Republican vote in the committee markup. But Moshe was not ready to give up on the man whom he had coveted for this job. Mitchell explained to Moshe that the bill was already dead by the time he was hired, just a couple of weeks before it was scheduled for consideration in the committee. 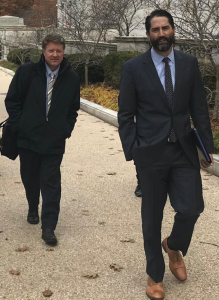 Most importantly, Mitchell had asked every Republican on the committee what it was precisely that they objected to in the bill, and learned that they were not ready to authorize federal prisoner re-entry grants to state and local agencies. 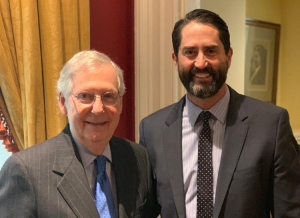 As for precisely what should be in a federal prison-reform bill, Mitchell began talking with the Judiciary Committee counsel to Sen. John Cornyn (R-Tex.) and researching the criminal justice reform programs that certain states, particularly Texas, had enacted. Mitchell recommends that Moshe hire Brett Tolman to join their team. Tolman is a Utah lawyer; he had formerly been the United States Attorney for Utah, and before that a counsel on the Senate Judiciary Committee when Mitchell had been lobbying for passage of the Second Chance Act. Tolman was a brilliant legal mind who could help draft the bill and provide it with credibility for conservative Republicans, as a former federal prosecutor advocating for criminal-justice reform. Tolman was confident that he could convince conservatives to get behind the effort – for two reasons. The Texas reforms had allowed prisoners to earn significant time off their sentences by participating in various recidivism-reduction programs while in prison. The upshot was that it would give productive, low-risk prisoners the opportunity to earn time credits to leave prison sooner and finish their sentence under some form of prerelease custody – such as a halfway house or home confinement – thus saving the prison system money, reuniting families more quickly, and giving prisoners the tools to be productive members of society once they returned home. Tolman began making frequent trips to Washington, and he, Mitchell and Margaretten began working on a federal bill inspired by the Texas model. Working primarily with Judiciary Committee counsels to Sens. Cornyn, Mike Lee (R-Utah) and Orrin Hatch (R-Utah), along with then-Rep. Jason Chaffetz (R-Utah), this draft would – following changes, political fights, dashed hopes and subsequent compromises – serve as the basis for the legislation that, seven years later, is on the brink of congressional passage. The initial bill, at Moshe’s insistence, allowed prisoners to earn time credits up to 50 percent of their sentence, the same percentage as in Rep. Lee’s bill from four years earlier, but with a crucial difference: Her bill would have given prisoners time off simply for good behavior, whereas in this new bill, prisoners would be earning their time credits by participating in recidivism-reduction programs and productive activities, and rather than early release, low-risk prisoners would become eligible for transfers into prerelease custody to finish their sentences in home confinement. The original bill focused only on “prison reform,” or “back-end reform.” But it did not provide “sentencing reform,” known as “front-end reform,” which would have made prison sentences shorter in the first place, because such reforms would have been unacceptable to many Republicans. 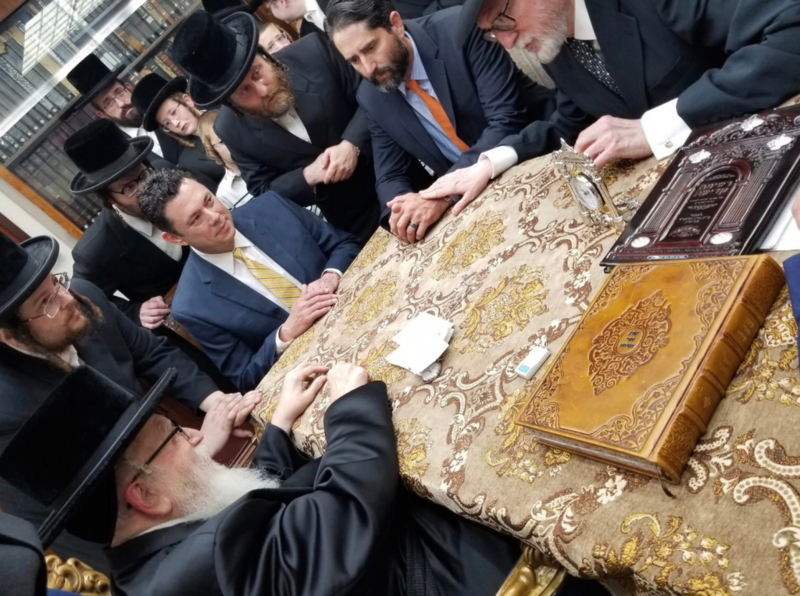 The Skverer Rebbe, shlita, meeting this year with prison-reform supporters, clockwise from left: Moshe Margaretten, former Rep. Jason Chaffetz, Hershy Gottdeiner, Brett Tolman, Gary Apfel. The Senate Judiciary committee holds a hearing called “Rising Prison Costs,” with Tolman testifying on the benefits of providing recidivism-reduction programs for prisoners. Throughout the years they have been working on this bill, Mitchell and Tolman say they have been inspired by the man who hired them. Working with Moshe has been “blood, sweat and tears,” says Mitchell. “His business and income have suffered because he has spent so much time raising money and communicating and planning with Brett and me. He is the guy that Brett and I strategize with. In the House, the first federal prison-reform bill, called the Public Safety Enhancement Act – and still offering prisoners earned time credits of up to 50 percent – is sponsored and introduced by Reps. Jason Chaffetz (R-Utah), and Bobby Scott (D-Va.) and supported by a number of other Members on both sides of the aisle. A hearing is held in the House Judiciary Committee in September. Meanwhile, Margaretten decided that he needed a Democratic-connected lobbying firm to join the team. He signed a contract with The Podesta Group, retaining them until Democrats lost the Senate at the end of 2014. In December, the Senate introduced its version of the bill, the Federal Prison Reform Act, sponsored by Republicans Cornyn, Lee, Hatch, and Charles Grassley of Iowa. While there was no support from Democrats, who were then in the majority, the Senate “became warmer to the bill,” as Moshe puts it, when it saw the bipartisan support in the House Judiciary Committee. While Republicans were finally supporting back-end reform, Democrats preferred front-end reform, particularly reforming the sentencing guidelines, mainly for drug offenders. But on the cusp of what seemed like the road to victory, the team would suffer a near-fatal disaster. 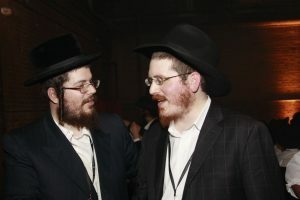 Issac Sofer (L) and Moshe Margaretten at a January 2018 reception celebrating Sholom Mordechai Rubashkin’s release from prison the previous month. So fundraising efforts were made in other cities, but not one penny was raised. And then something miraculous occurred. “On Motzoei Shabbos, Isaac called me with another guy on the line – Chesky Berkowitz, another Satmar Chassid,” says Moshe. “They told me, ‘Please send an email right now to a certain person and tell him how much you need.’ I emailed the man, a big baal tzedakah from Flatbush, who was a friend of Berkowitz’s, and wrote the amount of my debt. Five minutes later, he replied that I should meet his lawyer at his office the next day. And he gave me a check for the entire amount! The rejuvenated team was able to find new donors and continue their efforts. The back-end-only bill passes the Senate Judiciary Committee by a whopping 15-2. The only opponents were Sen. Dianne Feinstein (D-Calif.), who opposed it because there was no front-end reform; and Sen. Jeff Sessions (R-Ala.), a law-and-order Republican who opposed any reforms whatsoever. The 50-percent “earned time” credit – which had been unrealistic all along, is now at 25 percent, but the bill’s supporters are jubilant. But the excitement was to be short-lived. Senate Majority Leader Harry Reid (D-Nev.) makes clear that he will not allow the bill to go forward unless it is combined with front-end reforms. Mitchell, Tolman and Margaretten begin trying to find a way to work front-end reforms into the bill, but discussions quickly stall. This tug-of-war continues for a year-and-a-half. 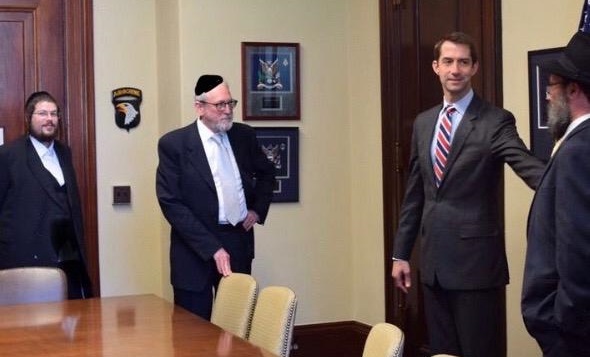 Sen. Tom Cotton (R-Ark., second from right), a vocal opponent of prison reform, meeting this year in his Capitol Hill office with, from left, Moshe Margaretten, Gary Apfel and Rabbi Pinchus Ciment of Chabad of Little Rock, Ark. Senate Judiciary Committee Chairman Charles Grassley, surrounded by a bipartisan group of his colleagues, announces that an agreement has been reached to add sentencing reforms to the federal prison-reform bill. It passes the Judiciary Committee 15-5. But there was not enough consensus for front-end reform on the Republican side of the aisle, and the presidential-election race was heating up. Candidate Donald Trump, piling up victories in Republican primaries, was running as a tough-on-crime candidate. Senate Majority Leader Mitch McConnell (R-Ky.) refused to allow a floor vote on a bill that would have Republicans vote against its party’s presidential nominee. In the House, the bill did not fare much better. The Judiciary Committee passed it unanimously by voice vote on February 11, 2016, and Speaker Paul Ryan (R-Wis.) wanted to bring it to the floor, but leading members of the conservative Freedom Caucus were adamantly opposed, and it stalled there as well. When President-elect Trump announces his intent to nominate Jeff Sessions as his attorney general, any hope of criminal justice reform seems dead on arrival. At this point, Mitchell and Tolman decide on a new course for his bill. Firstly, they would scrap the front-end reforms for now, fearing that the White House would never sign on for that. Secondly, this time they would start in the House, for it would be a tough go in the Senate, where Judiciary Committee Chairman Grassley, who had become one of the biggest supporters of reform, had joined the Democrats in insisting that the bill include front-end reforms. Gary Apfel, Los Angeles-based attorney for Sholom Mordechai Rubashkin, receives a call from the White House informing him that President Trump has just pardoned his client. Spontaneous celebrations break out in Jewish communities across the globe, and many legal officials celebrate the overturning of what they say was a stain on the U.S. justice system. 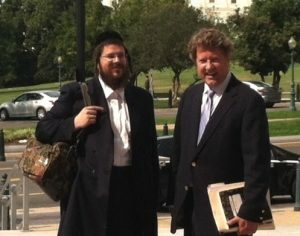 Apfel, who had been somewhat involved in the prison-reform effort since late 2015 – it was Boyarsky, with whom Apfel worked closely on the Rubashkin case, who first told Apfel about the reform effort – but was generally occupied with Rubashkin, now turns his full attention to advocating for this bill. Relatives of Rubashkin expand their efforts as well. 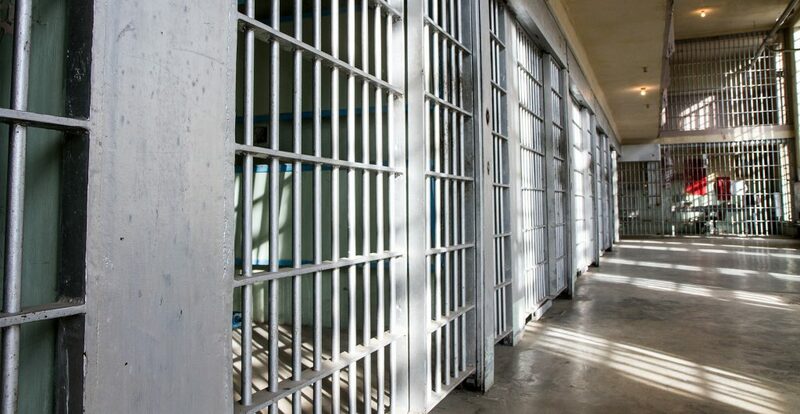 The bill provided up to 33 percent of “earned time” credits for prisoners who participate in rehab programs, and raised the time off for good behavior from 12.5 percent to 15 percent. It would allow prisoners who are at least 60 years old and have served two-thirds of their sentence to serve the remainder in home confinement. It also sought to improve conditions for prisoners, such as by increasing phone access and allowing for additional visitation time. The bill had been sponsored, for years, by Judiciary Committee members Rep. Hakeem Jeffries (D-N.Y.), and Rep. Jason Chaffetz (R-Utah) – once again, Tolman’s home-state connections were paying off. But when Chaffetz retired in the middle of the term, a new Republican sponsor in the committee was needed. 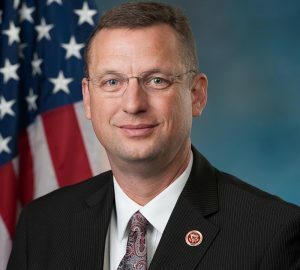 Mitchell found one in Rep. Doug Collins (R-Ga.). While there was some pushback in the House from a few conservatives, most of the opposition came from Democrats who were upset that the bill did not include front-end reforms. But the White House, which had announced its enthusiastic support for the bill, had indicated it would not support front-end at this time. Knowing that the back-end-only bill would face stiff opposition in the Senate from Grassley and from liberal Democrats, supporters sought at least 280 votes in the House (far more than the 218 generally required for passage) to give it momentum heading into a Senate showdown. An intense lobbying effort by the team ensued. Apfel liked to tell skeptical Congress Members that refusing to pass the back-end-only bill was like the child who refuses a scoop of ice cream because he really wants the entire tub. The House passes the FIRST STEP Act 360-59, with support from significant majorities of both parties, including the parties’ leadership. The bill had a powerful advocate in the White House in Trump’s son-in-law and adviser Jared Kushner. Sessions was still opposed, but he and Kushner had reached an agreement whereby Sessions would not voice opposition to the bill, and the White House would support only back-end reforms. But now, as the bill headed for a tough Senate fight, the National Association of Assistant United States Attorneys, along with several conservative senators, began rallying opposition to the bill. Observers believed that Sessions had been secretly stoking the opposition. Supreme Court Justice Anthony Kennedy announces his retirement. Shortly afterward, President Trump nominates Judge Brett Kavanaugh to replace him. With Republicans holding a narrow 51-49 majority in the Senate, and Kavanaugh facing a bruising nomination battle in the Judiciary Committee and perhaps the full Senate, Grassley, the Judiciary Committee chairman, gains immense leverage with the White House. Grassley, who has made it clear that passage of front-end reform was a major priority, begins crafting a bill that includes a limited number of sentencing reforms, mostly for drug offenders. Only a few conservative Republicans are vocally opposing it. With the exception of a handful of liberal Democrats who feel the front-end reforms do not go far enough, the bill has solid Democratic support. And the White House, after Trump has spent more time speaking to various reform advocates, is indicating that perhaps it would go for these limited front-end reforms. Sessions was likely losing sway in the administration. Trump had been angry at him ever since — more than a year earlier — he had recused himself from the investigation into possible collusion between the Trump campaign and Russia. And there was widespread belief that Sessions would be out after the midterm elections. But Senate Majority Leader Mitch McConnell was now emerging as a formidable stumbling block for the bill’s supporters. Ahead of a looming vote on Kavanaugh in which Republicans would need every vote they had, and midterm elections in which Republicans were in danger of losing their majority, McConnell did not want to hold any votes that would splinter his caucus in any way. The upshot of the meeting is that Trump takes McConnell’s side, declining to support the bill just then. But he assures Grassley that the bill will be a priority following the midterm elections. Greg Mitchell (L) and Brett Tolman on Capitol Hill this year. A day after the midterm elections, Sessions announces his resignation as attorney general, which he says came at the president’s request. In the elections, Republicans lose their House majority, but – after recounts and a runoff election – eventually gain two Senate seats, for a total of 53. President Trump announces his support for the FIRST STEP Act, including the front-end reforms. The Act has gained the support of several police organizations, including the Fraternal Order of Police and the International Association of Police Chiefs. McConnell reportedly will bring the bill to a vote if it has the support of the 60 senators required to defeat a filibuster. The bill likely has support of far more than 60 senators – all but a few conservatives and a few liberals. But congressional sources tell the bill’s supporters that McConnell won’t put the bill forward unless a majority of its supporters are Republican. At the absolute least, 30 Republicans would have to sign on for McConnell to consider it. While only a handful of Republicans are vocally opposed, most have not taken a side. Sitting in the Hamodia office, Moshe Margaretten can barely take his eye off his phone, as he nervously awaits news from Mitchell and Tolman. Today is a big day for the bill’s fate. The National Sheriffs Association is withholding its support over disagreements on front- and back-end reforms. If Senate negotiators can reach an agreement with the Association, most Republicans would likely support the bill, and McConnell would allow a vote to be held during the lame-duck session of Congress. Prisoners and their families have been calling Moshe all day, awaiting the result of the negotiations. It’s after 4:00 p.m. when word finally comes down, and it is mostly good news. Congressional negotiators have reached an agreement on all but one of the changes requested by the National Sheriffs Association: expanding judges’ ability to override the mandatory minimum sentences for drug offenders who cooperate with law enforcement. The lobbying team is hopeful that this can be worked out. Two more bits of good news come down that evening: Rep Collins, the FIRST STEP Act’s sponsor, wins his bid to become Ranking Member of the Judiciary Committee in the upcoming Congress. And Senate Majority Leader McConnell has sent a notice to Senate chiefs of staff. They should be prepared to stay in Washington until December 20, and to have votes on two items: judicial nominees and prison reform.